The National Center for the Performing Arts of China is an artfully-crafted masterpiece that sits in the heart of Beijing, next to the Great Hall of the People and close to Tiananmen Square. 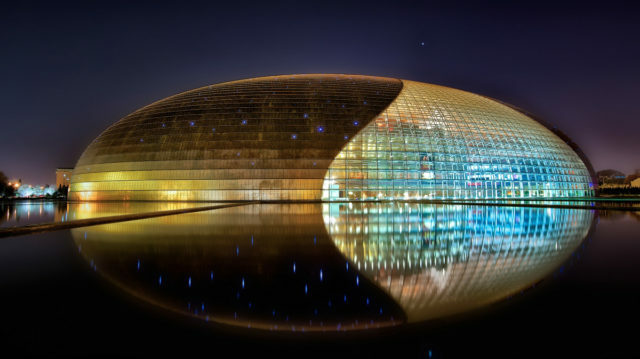 Designed by French architect Paul Andreu, the $400 million art complex’s architectural design was meant to stand as a tribute to China’s traditional image of heaven and earth. The stunning structure, which features a curved shell that is comprised of titanium and glass, takes on the appearance of a floating pearl. Once guests pass through the building’s glass-enclosed entrance that sits underneath the surrounding lake, they are greeted by the center’s equally extravagant interior. Inside the performing arts center, theatergoers will have access to the stunning performance halls and opera house. Light, transparency, and space are three elements that the building emphasizes, creating an extraordinary theater-going experience for visitors. The National Grand Theater’s eye-catching exterior was fitted with approximately 462,848 square-feet of ALPOLIC’s titanium composite material (TCM) in a natural metal finish. Each recyclable, lightweight panel contains a Lumiflon topcoat, which offers the structure as a whole a plethora of benefits. Surfaces that are strengthened with FEVE-based resins remain in pristine condition for decades. Coatings that employ Lumiflon FEVE resin technology have outstanding color and gloss retention properties, in addition to outstanding weatherability and durability.